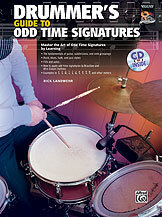 I am the author of Drummer’s Guide to Odd Time Signatures (Alfred/National Guitar Workshop). I wanted to see a book on the shelves that clearly covered several genres and applications in a way that was not over the heads of musicians unfamiliar with the material. I felt the conceptual information and explanations of how to apply the material was much more important than pages of patterns with no explanation on how to use them. It was also important to me to have sections covering fill playing since many drum method books focus strictly on time playing. Drummer’s Guide to Odd Time Signatures won second-runner up for best drum book in the 2010 Drum! Magazine Drummies readers poll awards. More information can be found at the Alfred Publishing website. You can also find it at all major stores and online retailers that carry music method books including Amazon.com.